By default, your express application will store session data in memory. That means if your server restarts all users will need to log back in. Additionally, this does not scale to more than one instance, leaks memory and does other mean things. While this works while developing your local computer (notice how you always need to log in after making a code change), you will want something better for production. Heroku even warns you if you do this. Try running $ heroku logs --tail to see this. This will create a REDIS_URL in the heroku config that you will use to connect. Use $ heroku config:get REDIS_URL to see this value. Note: your local computer probably does not have REDIS_URL set. How do you run your project locally now? 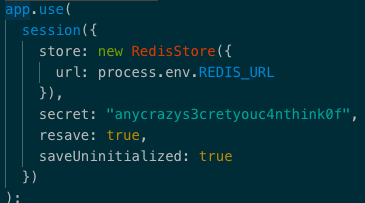 Check your NODE_ENV setting and if its not production we will default the store property to null. Run these commands and connect to your instance directly. If you try running your project locally, you will notice that your session store fails to initialize and things break – this happens since you likely do not have the REDIS_URL set.